Known today as Tell el-Muqayyar, the “Mound of Pitch,” the site was occupied from around 5000 B.C.E. to 300 B.C.E. Although Ur is famous as the home of the Old Testament patriarch Abraham (Genesis 11:29-32), there is no actual proof that Tell el-Muqayyar was identical with “Ur of the Chaldees.” In antiquity the city was known as Urim. The main excavations at Ur were undertaken from 1922-34 by a joint expedition of The British Museum and the University Museum, Pennsylvania, led by Leonard Woolley. At the center of the settlement were mud brick temples dating back to the fourth millennium B.C.E. At the edge of the sacred area a cemetery grew up which included burials known today as the Royal Graves. An area of ordinary people’s houses was excavated in which a number of street corners have small shrines. But the largest surviving religious buildings, dedicated to the moon god Nanna, also include one of the best preserved ziggurats, and were founded in the period 2100-1800 B.C.E. For some of this time Ur was the capital of an empire stretching across southern Mesopotamia. Rulers of the later Kassite and Neo-Babylonian empires continued to build and rebuild at Ur. Changes in both the flow of the River Euphrates (now some ten miles to the east) and trade routes led to the eventual abandonment of the site. Close to temple buildings at the center of the city of Ur, sat a rubbish dump built up over centuries. Unable to use the area for building, the people of Ur started to bury their dead there. The cemetery was used between about 2600-2000 B.C.E. and hundreds of burials were made in pits. Many of these contained very rich materials. This object was found in one of the largest graves in the Royal Cemetery at Ur, lying in the corner of a chamber above the right shoulder of a man. Its original function is not yet understood. Leonard Woolley, the excavator at Ur, imagined that it was carried on a pole as a standard, hence its common name. Another theory suggests that it formed the soundbox of a musical instrument. When found, the original wooden frame for the mosaic of shell, red limestone and lapis lazuli had decayed, and the two main panels had been crushed together by the weight of the soil. The bitumen acting as glue had disintegrated and the end panels were broken. As a result, the present restoration is only a best guess as to how it originally appeared. 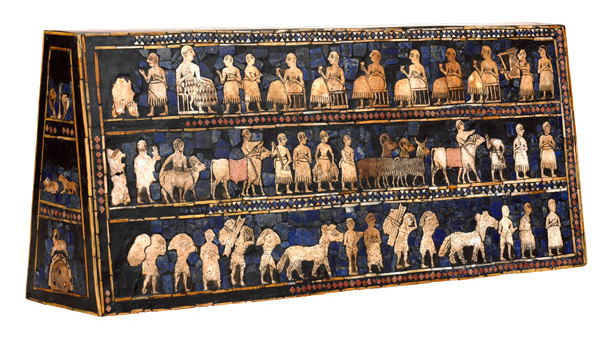 The main panels are known as “War” and “Peace.” “War” shows one of the earliest representations of a Sumerian army. Chariots, each pulled by four donkeys, trample enemies; infantry with cloaks carry spears; enemy soldiers are killed with axes, others are paraded naked and presented to the king who holds a spear. The “Peace” panel depicts animals, fish and other goods brought in procession to a banquet. Seated figures, wearing woolen fleeces or fringed skirts, drink to the accompaniment of a musician playing a lyre. Banquet scenes such as this are common on cylinder seals of the period, such as on the seal of the “Queen” Pu-abi, also in the British Museum (see image above). Leonard Woolley discovered several lyres in the graves in the Royal Cemetery at Ur. This was one of two that he found in the grave of “Queen” Pu-abi. Along with the lyre, which stood against the pit wall, were the bodies of ten women with fine jewelry, presumed to be sacrificial victims, and numerous stone and metal vessels. One woman lay right against the lyre and, according to Woolley, the bones of her hands were placed where the strings would have been. This musical instrument was originally reconstructed as part of a unique “harp-lyre,” together with a harp from the burial, now also in The British Museum. Later research showed that this was a mistake. A new reconstruction, based on excavation photographs, was made in 1971-72. J. Aruz, Art of the First Cities: The Third Millennium B.C. from the Mediterranean to the Indus (New York, 2003). D. Collon, Ancient Near Eastern Art (London, 1995). H. Crawford, Sumer and Sumerians (Cambridge, 2004). N. Postgate, Early Mesopotamia: Society and Economy at the Dawn of History (London, 1994). 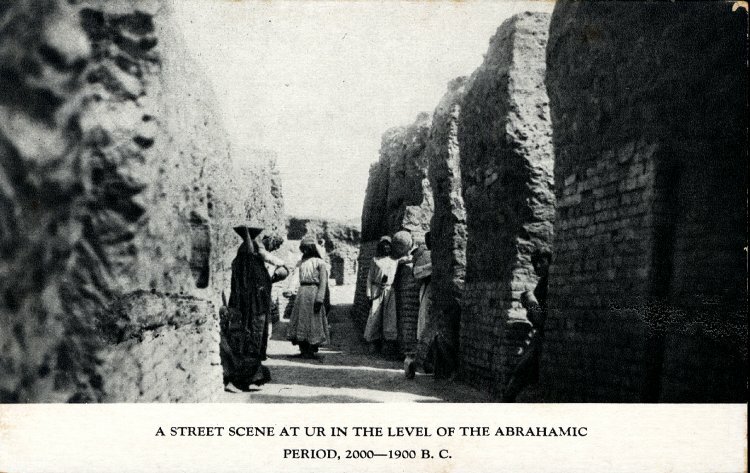 M. Roaf, Cultural atlas of Mesopotamia (New York, 1990). C.L. Woolley and P.R.S. Moorey, Ur of the Chaldees, revised edition (Ithaca, New York, Cornell University Press, 1982). N. Yoffee, Myths of the Archaic State: Evolution of the Earliest Cities, States, and Civilization (Cambridge, 2005). R. Zettler, and L. Horne, (eds.) Treasures from the Royal Tomb at Ur (Philadelphia, 1998). Cite this page as: The British Museum, "Standard of Ur and other objects from the Royal Graves," in Smarthistory, March 3, 2017, accessed April 22, 2019, https://smarthistory.org/standard-of-ur-and-other-objects-from-the-royal-graves/.